In recent years the prevalence of heart disease as the #1 killer in women has become better recognized. Peripheral arterial disease (PAD) is a similar process but involves narrowing of the arteries in the leg rather than the heart and often is considered a disease predominantly affecting males. However, recent evidence suggests that not only is peripheral arterial disease as common in women as men but also may lead to greater disability. Approximately 20% of Americans older than age 65 suffer from peripheral arterial disease but only one-third are symptomatic. Based on a recent survey conducted by the PAD Coalition, only 28% of American women have ever heard of PAD, a very common and dangerous condition that affects nine million Americans, half of whom are women. This relationship equates to one female in 20 over age 50 and one in five over age 70. Although PAD can cause symptoms such as cramping in the legs, pain at rest, numbness or skin discoloration, the majority of cases early in this disease are asymptomatic. In fact, women may even be more likely than men to have PAD without experiencing symptoms as studies have shown that 50 to 90% are asymptomatic or have symptoms unrecognized to be related to PAD. Overall, only one in three patients with PAD has symptoms suggestive of any problem with their feet or legs. Despite the lack of symptoms in most PAD cases, it is extremely important to obtain early diagnosis. PAD occurs when arteries in the legs develop plaque formation leading to diminished blood flow. However, the same process of plaque formation that occurs in the legs is occurring simultaneously in other areas of the body such as the arteries that supply the heart and brain. In the long-term, people with PAD have four times the risk of heart attack or stroke. In addition, in a person with a very low ABI evaluation, which we describe below, has a two to three times increased risk of five year cardiovascular death compared to a patient with a normal ABI. In addition to the markedly increased risk of heart attack and stroke caused by the presence of PAD, a recent study published in the Journal of the American College of Cardiology also shows that peripheral arterial disease produces disability in women faster than men. In a recent study performed at Northwestern University and several sites throughout the United States, 380 men and women with PAD were evaluated and followed for worsening functional capacity up to four years. The participants all completed the six minute walk at the initiation of the study and CT scanning of the calf muscle characteristics was measured biannually. Men and women were then measured for outcomes including becoming unable to walk for six minutes continuously among participants who had been able to walk for six minutes at baseline. The patients also were evaluated for mobility lost, defined as become unable to walk for a quarter-mile or to walk up and down one flight of stairs without assistance. The results were adjusted for age, race, body mass index, physical activity and co-morbidities. Results showed at four years of follow up that women were more likely to become unable to walk for six minutes continuously and more likely to develop mobility disability. Women also had faster declines in walking velocity and in the distance achieved in the six minute walk compared to men. The more rapid functional decline and greater disability in women was attributed to smaller baseline calf muscle area among women with PAD. To summarize, women have an incidence of PAD equal to men, have greater functional loss compared to men and have markedly elevated rates of heart attack and stroke equivalent to males. Therefore, it is very important to identify early the presence of PAD and treat it appropriately. PAD is easily screened for by a simple ABI evaluation which involves measuring blood pressures along the length of the upper and lower legs and compare blood pressures to the arms. 1. Patients over age 50. 2. 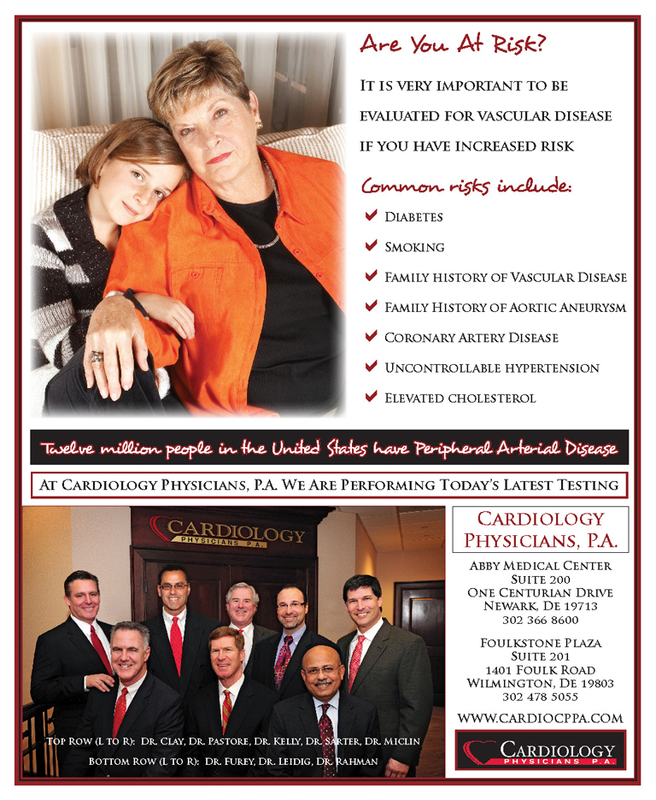 Patients with family history of vascular disease such as PAD, aneurysm, heart attack or stroke. 3. Patients with high cholesterol levels. 4. Patients with diabetes mellitus. 5. Patients with any history of smoking. 6. Patients with a personal history of hypertension, heart disease or other vascular disease. 7. Patients with pain in the legs or feet that awaken you at night. Therapy for PAD is typically initiated with conservative measures. A regular walking program and exercise is critically important. Smoking cessation, lipid therapy and blood pressure control should be initiated. Patients that do not respond adequately or have worsening symptoms may also be treated with revascularization procedures such as stenting or vascular surgery. Patients that fit into one of the above mentioned categories and risk groups should discuss screening ABI evaluation with their physician. The prognosis of peripheral arterial disease can be greatly improved with early intervention. Dr. Alan Micklin joined Cardiology Physicians, P.A. in July of 2006. He began his studies as an undergraduate biology major at the University of Delaware and graduated in 1986. He then went on to attend the Hahnemann University School of Medicine from 1986 to 1990. Upon his graduation in 1990, he started his residency in Internal Medicine at Hahnemann University. He began his fellowship in cardiovascular disease at Hahnemann in 1993 and was the chief cardiology fellow from 1994-1995. Dr. Micklin is certified in internal medicine and cardiovascular disease, as well as interventional cardiology. He has also been certified to perform nuclear cardiology procedures since 1996 and is certified to interpret vascular ultrasound studies. Dr. Micklin specializes in both nuclear and interventional cardiology and had been practicing since 1996 in Charlotte, North Carolina before joining Cardiology Physicians. At the University of Delaware he was a member of the Phi Beta Kappa and at Hahnemann University he was a member of Alpha Omega Alpha Honor Societies. He also received a commendation for Superior Performance during his residency at Hahnemann. Some of his clinical responsibilities include nuclear stress testing, echocardiography, and vascular ultrasound. As an interventional cardiologist, Dr. Micklin also performs diagnostic cardiac catheterization including intravascular ultrasound as well as stent placement and angioplasty. He has a strong commitment to inpatient and outpatient clinical patient care. Dr. Mickin is married with three children. Both he and his wife attended the University of Delaware and were members of the Class of 1986. Hobbies include boating, skiing and golf. Next Story → Are You Ready For Summer?